Use this example letter if you are going to leave your job as Mortgage Adviser gracefully. Do not forget to amend this letter as suitable before sending it to your employer. As a Mortgage adviser your job is to help people find, and apply for mortgages. 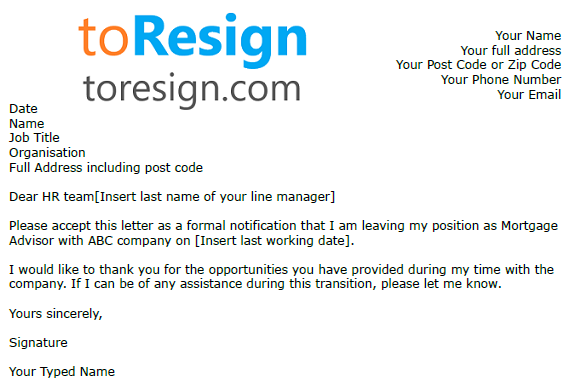 Please accept this letter as a formal notification that I am leaving my position as Mortgage Adviser with ABC company on [Insert last working date]. I would like to thank you for the opportunities you have provided during my time with the company. If I can be of any assistance during this transition, please let me know.